Federica Mogherini, High Representative of the EU for Foreign Affairs and Security Policy and Bruno Rodriguez, Cuban Minister of Foreign Affairs. Photo: EU, All rights reserved. The European Union (EU) and Cuba are showing signs of moving towards establishing a strong relationship. This is happening despite a string of previous meetings, misunderstandings, US policy under Donald Trump, and the persistence of sectors within and outside the EU and the island opposed to advancing bilateral ties. On May 15, the first ever joint Council between Cuba and the EU was held in Brussels. The High Representative of the EU for Foreign Affairs and Security, Federica Mogherini, and the Cuban Foreign Minister, Bruno Rodríguez, met (again) to mark the start of implementation of the Political Dialogue and Cooperation Agreement (PDCA) which came into effect provisionally in December 2017 and put an end to two decades of a restrictive position with respect to Cuba by the European Council. For the first time in thirty years of official relations, it puts both actors within the framework of an institutionalized bond - this increases contacts, which become stable and permanent. The importance of this agreement is multiple. For the first time in thirty years of official relations, it puts both actors within the framework of an institutionalized bond - this increases contacts, which become stable and permanent. It also prompts them to find suitable formulas to put into practice what has been agreed upon in general terms, thus avoiding impasses and stagnation. Although this is most apparent and practical for the immediate future, what is perhaps equally important is the fact that the agreement has changed the attitudes of both signatories - without sacrificing their principles or values -, and has allowed them to work on common ground and create "gateways" to new areas in which previously unidentified common interests may emerge. Only the provisional clauses of the agreement are in force for the time being, pending the ratification of the whole by the parliaments of the twenty-eight EU member states. These provisional clauses, however, cover an important part of the agreement, and this has allowed a series of initiatives to be taken at the joint Council meeting in Brussels. First of all, the concretion of an 18 million euros cooperation project on renewable energy, the very first to give actual content to the new bilateral relations framework, on an issue of special relevance for Cuba, which aims to include a significant component of non-polluting energies to its energy matrix, coinciding in general terms with the policy proposals of the EU in this area. The institutionalizing of political dialogue in five specific areas - human rights, sustainable development, disarmament, the fight against the illegal small arms trade and unilateral coercive measures - is another of the joint Council's significant results, which opens up new lines of work. The regular meetings agreed upon will address issues which, while being of common interest, are approached in different ways by the parties. In contrast to previous moments in the relationship, it does seem not only that a decision has been made on both parts to build spaces for dialogue and cooperation and to focus on consensus rather than dissent, but also to discuss the latter. Donald Trump’s government has intensified the application of the policy of blocking Cuba in the financial sector, a decision which has a strong extraterritorial impact on European banks and companies. The ratification by Cuba of the agreement establishing the European Union-Latin America and the Caribbean Foundation (EU-LAC), negotiated at the end of the first decade of this century, was also announced. This ratification incorporates Cuba to the intergovernmental organization whose objective is the strengthening of the bi-regional association between the EU and its member States on the one hand, and the Community of Latin American and Caribbean States (CELAC) on the other. The preparation of another 21 million euro agreement on food security and sustainable agriculture was announced by the EU High Representative at the press conference at the end of the Joint Council. The expressed will to promote exchanges for the European Year of Cultural Heritage and to support the celebrations of the 500-year anniversary of the founding of the city of Havana in 2019 - a request that historian Eusebio Leal made publicly to Federica Mogherini during her visit to Cuba last January, and which she gladly accepted – were among the finer topics on which decisions were also made. All these advances are taking place in a context which is not exempt from risks and obstacles. On the one hand, in contrast to the openness of the Barack Obama administration, Donald Trump’s government has intensified the application of the policy of blocking Cuba in the financial sector, a decision which has a strong extraterritorial impact on European banks and companies. On the other hand, the EU's approach to the island is still being questioned by those in Europe who emphasize the issues where the perceptions of both actors are more divergent, such as human rights and the situation in Venezuela. With or without a common position, the EU advocates for an economic and political opening in Cuba. But this has not prevented the EU from finding that this tactic was wrong and that a bilateral instrument was needed in order to overcome the anomalous situation which was making Cuba one of the very few countries in the world whose relations with the EU lacked a contractual framework. According to the High Representative, today Cuba is not alone facing those who "raise walls and close doors". Some new approaches to the Cuban reality have now become apparent in discourse, such as explicitly calling - in Spanish - "bloqueo" what had always been called "embargo" in the EU – Mogherini used this term in Havana on January 3, 2018, and again in her speech at the press conference after the Joint Council, on May 15. More importantly, according to the High Representative, today Cuba is not alone facing those who "raise walls and close doors". The EU has found a way to show its own path in contrast with the Trump Administration, spotlight it and move forward. Its new policy stance could also serve to "support the process of economic and social reform in Cuba." It should be noted, in addition, that half of the EU member states have already ratified the ADPC. 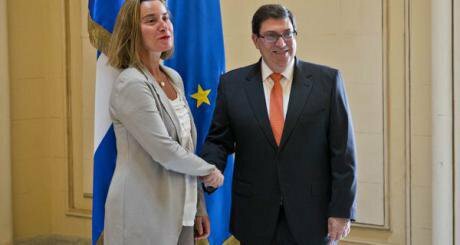 The Cuban government, for its part, has expressed its wish for "a more active participation of the European Union in the economic development" of the island. The chancellor, Bruno Rodríguez, considers that the conditions are favourable for expanding ties further. Obviously, the presence and participation of the EU, and particularly its objectives, are viewed quite differently depending on the perspective - from Brussels or Havana. But it is nevertheless a fact that there are spaces where these perspectives converge and that the EU has quite evidently managed to position itself on the island: today, it is already Cuba’s first trading partner, the first investor and the first supplier of development aid. The current framework agreement is about political dialogue and cooperation. True, compared to the rest of the areas it covers, the scope of the agreement on trade is admittedly quite limited. But it could be one of the main areas for evolution in the future. The EU market is a very demanding one, with very strict quality standards and specific access requirements depending on the products, and although this may theoretically be an incentive to improve standards in countries which, like Cuba, have an interest in having greater access to the EU market, it is also clear that it is an obstacle. In this sense, Cuba would probably wish to be offered a relaxation of the rules of the General Preference System for some given products, as this would allow it to access the market in a similar way to what it did in the past, and perhaps also some specific rules for products that both parties may agree on. For the time being, the implementation of the ADPC offers a framework which is broad enough for expanding and strengthening EU-Cuba relations. Success in implementing it will lay the foundations for positive evolution in the future. The roadmap from now on can be very diverse, for the agreement signed includes practically all possible areas of bilateral cooperation. However, it should focus on the understanding that the agreement is not an end in itself, but a means to strengthen the bilateral relationship, and that the bond between Cuba and The EU will keep on progressing and evolving depending on the way in which it is implemented.